Black Lives Matter co-founder Patrisse Khan-Cullors on her path to activism and being criminalized at age 12. The first time I am arrested, I am 12 years old. One sentence and I am back there, all that little girl fear and humiliation forever settled in me at the cellular level. It’s the break between seventh and eighth grades, and for the first time I have to attend summer school because of my math and science grades and I am angry about it. No other Millikan kids come here, to this school in Van Nuys, for remediation, only me. The summer school I attend is for the kids who live in my neighborhood. It doesn’t have a campus, but it has metal detectors and police. There are no police or metal detectors at Millikan. Somehow, mentally, I don’t make the adjustment. I still think of myself as a student there, which I am but not for these summer months, and one day I do what I’d learned from my Millikan peers to do to cope: I smoke some weed. At Millikan it is a daily occurrence for kids to show up to class high, to light up in the bathroom, to smoke on the campus lawn. No one gets in trouble. Nowhere is there police. Millikan is the middle school where the gifted kids go. But in my neighborhood school things are totally different and someone must have said something about me and my weed—two girls had come into the bathroom when I’d been in there—because two days later a police officer comes to my class. I remember my stomach dropping the way it does on one of those monster roller-coaster rides at Six Flags. I can just feel that they are coming for me and I am right. The cop tells me to come to the front of the room, where he handcuffs me in front of everyone and takes me to the dean’s office, where my bag is searched, where I am searched, pockets turned out, shoes checked, just like my brothers in the alleyway when I was 9 years old. I have no weed on me but I am made to call my mother at work and tell her what happened, which I do through tears. I didn’t do it, Mommy, I lie through genuine tears of fear. My mother believes me. I am the good girl and she takes my side. Later, when we are home together, she will not ask me how I am feeling or get righteously angry. She will not rub my wrists where the handcuffs pinched them or hold me or tell me she loves me. This is not a judgment of her. My mother is a manager, figuring out how to get herself and her four children through the day alive. That this has happened, but that she and her kids are all at home and, relatively speaking, safe, is a victory for my mother. It is enough. And for all of my childhood, this is just the way it is. What made middle school such a culture shock, beyond the race and class differences, was that all throughout elementary school I was considered bright, gifted even, a star student whom my fourth-grade teacher, Ms. Goldberg, indulged when I asked if I could teach the class about the civil rights movement. A week before she had given me a book, The Gold Cadillac by Mildred Taylor, about a girl making the frightening drive with her father from Ohio through the Jim Crow South, down to Mississippi, where her extended family lives. The terror in it was palpable for me, the growing sense on every page that they might be killed; by the time I was 9, police had already raided our small apartment in search of one of my favorite uncles, my father Alton’s brother. My uncle who used and sold drugs, and who had a big laugh and who used to hug me up and tell me I was brilliant, but who did not with live us, whose whereabouts we did not know the day the police in full riot gear burst in. Even tiny Jasmine, probably 5 years old during that raid, was yelled at and told to sit on the couch with me as police tore through our home in a way I would never later see on Law and Order: Special Victims Unit, where Olivia Benson is always gentle with the kids. In real life, when I was a little kid, when my brothers and sisters were, we were treated like suspects. We had to make our own gentle, Jasmine and I, holding each other, frozen like I was the day of the alleyway incident, this time cops tearing through our rooms instead of the bodies of my brothers. They even tore through our drawers. Did they think my uncle was hiding in the dresser drawer? But as with the incident with my brothers, we did not speak of it once it was over. I am sure this incident is at least partially why The Gold Cadillac was a story I clung to so deeply, why I remember it now, decades on. Where the details wove together differently, the fear drawn out across those pages is the same, is my own. Finishing it, I wanted more. I wanted confirmation that that which we did not speak of was real. Which was why I asked, Please, Ms. Goldberg, may I have more books to read? Of course, she said, and gave me stories I devoured, child-size bites of the fight for freedom and justice. Please, I went back and asked Ms. Goldberg, can I teach the class about the books? Yes, she said, Why not? Because that’s how she was. Ms. Goldberg, with her ’80s feathered brown hair and her Flashdance-style workout gear she wore to school every day. I had a reward—pieces of candy—for my classmates who answered the questions I posed during the 15-minute presentations I was allowed to give on the books I read. I wanted them to know our history in this nation, what it was we come from. I wanted them to learn, as I had learned, the terror we knew. Somehow it connected to a terror I—we—felt in our own neighborhoods, in our own current lives, but could not quite name. But between Ms. Goldberg and then Ms. Bilal—the afterschool teacher and the single dark-skinned Black woman I would have during my early education, who brought us Kwanzaa and Afrocentricity—I turned toward middle school hopeful, even if it was in a community I didn’t know, a community without my community. I expected to still be loved, encouraged. Millikan Middle School is sufficiently far enough away from my home that I need a ride each morning in order to get to school on time. Before, I could simply hop on the city bus with all the other kids from my hood, but getting into Sherman Oaks is a more complicated endeavor. The problem is that my family does not own a car, which is why our neighbor Cynthia steps in to help. My mother borrows her car to ensure my safe passage. This is not quite as straightforward as it may sound. Cynthia, no more than 19, a young mother who has on and off been involved with my brother Monte and who will eventually have a child, my nephew Chase, with him, had been shot a year before in a drive-by while she was at a party. From the waist down, she was left paralyzed. But she has a car she loans my mother, a beat-up, champagne-colored station wagon. The back windows are gone, replaced by plastic lining, and the whole thing smells like pee because with Cynthia being mostly paralyzed, she loses control of her bladder. 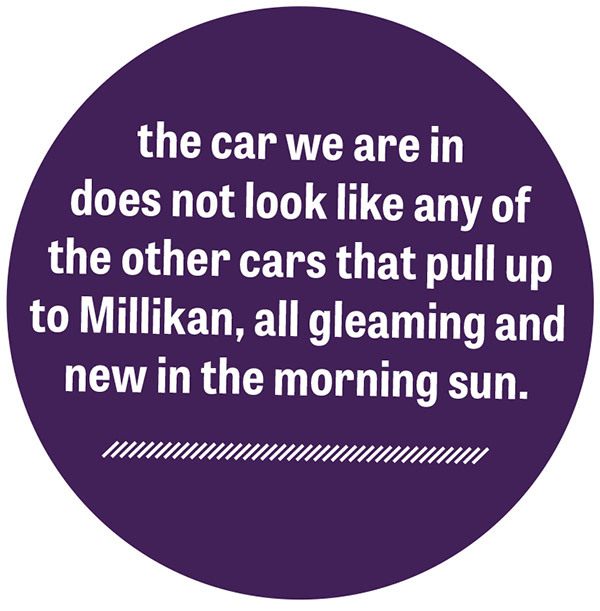 My mother takes me to Millikan in that car, which initially I deal with because, a car! But after the first day, I realize quickly I have to make a change. Day two and I say, Drop me off here, Mommy, meaning a few blocks away from the school. The car we are in does not look like any of the other cars that pull up to Millikan, all gleaming and new in the morning sun. Kids pour out of those vehicles, Mercedes and Lexuses, and run from waving parents onto the campus’s greener-than-green lawn, as all at once I become familiar with a sudden and new feeling taking root in my spirit: a shame that goes deep, that is encompassing and defining. I realize we are poor. Later, as an adult, a friend will say to me, Of course you felt that. Oppression is embarrassing, she will say quietly. But in middle school, segregated as it is, between Black and white kids, wealthy and poor kids, I don’t quite know what to do with this feeling or the terrible question that encircles my 12-year-old soul: Am I supposed to be embarrassed about the people who nurtured me, who gave me to the world and gave the world to me? I don’t fit in with the white kids who smoke weed in between classes in bathrooms or on the campus lawn. I don’t fit in with the few Black girls who want to be Janet Jackson or Whitney Houston when they grow up. I wear MC Hammer pants, crotch swinging low. I wear my own brand of Blackness informed as it also is by the Mexicanness of the neighborhood I was raised in. People say I am weird, but I don’t feel weird. I only feel like myself: a girl from Van Nuys who loves poetry and reading and, more than anything, dancing. I am in the dance department and my dances are equal parts African, Hip Hop and Mariachi, which is also to say, weird. Middle school is the first time in my life when I feel unsure of myself. No one is calling me gifted anymore. No one, save for my dance teacher, encourages me or seems to have patience with me. It’s in middle school that my grades drop for the first time and that I come to believe that maybe all that love I’d gotten in elementary school had somehow dried up, my ration run dry. 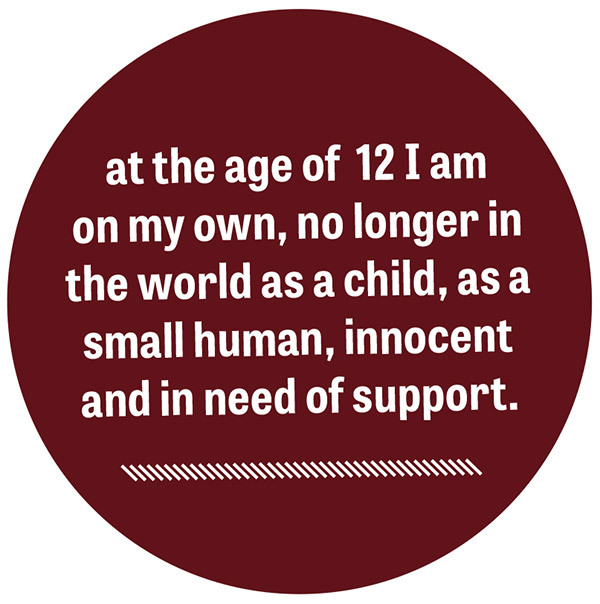 At the age of 12 I am on my own, no longer in the world as a child, as a small human, innocent and in need of support. I saw it happen to my brothers and now it was happening to me, this moment when we become the thing that’s no longer adorable or cherished. The year we become a thing to be discarded. I learned I didn't matter from the very same place that lifted me up, the place I'd found my center and voice: school. And it will not be until I am an adult, determined to achieve a degree in religion, part of a long and dedicated process I undertook to become an ordained minister, that I will enjoy school again. A few years after I complete my degree, Dr. Monique W. Morris published her groundbreaking book, Pushout: The Criminalization of Black Girls in Schools, demonstrating how Black girls are rendered disposable in schools, unwanted, unloved. Twelve percent of us receive at least one suspension during our school careers while our white (girl) counterparts are suspended at a rate of 2 percent. In Wisconsin the rate is actually 21 percent for Black girls but 2 percent for white girls. 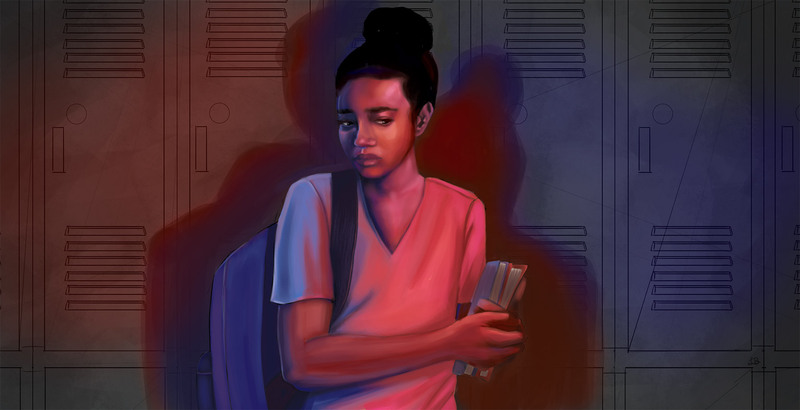 By the time Black Lives Matter is born, we not only know that we have been rendered disposable because of our lived experience—which few listened to—but also from data and finally from those terrible, viral images of Black girls being thrown brutally out of their seats by people who are called School Safety Officers, for the crime of having their phones out in the classroom. Monique Morris’s reporting will tell us about the 12-year-old girl from Detroit who is threatened with both expulsion and criminal charges for writing the word “Hi” on her locker door; and the one in Orlando who is also threatened with expulsion from her private school if she doesn’t stop wearing her hair natural. Twelve, and out of time. Patrisse Khan-Cullors is an artist, organizer and freedom fighter from Los Angeles. A co-founder of Black Lives Matter, she is also a performance artist, Fulbright scholar, popular public speaker and an NAACP History Maker. asha bandele, author of the best-selling and award-winning memoir The Prisoner’s Wife and four other works, has been honored for her work in journalism, fiction, poetry and activism. A mother and a former senior editor at Essence magazine, asha serves as a senior director at the Drug Policy Alliance. 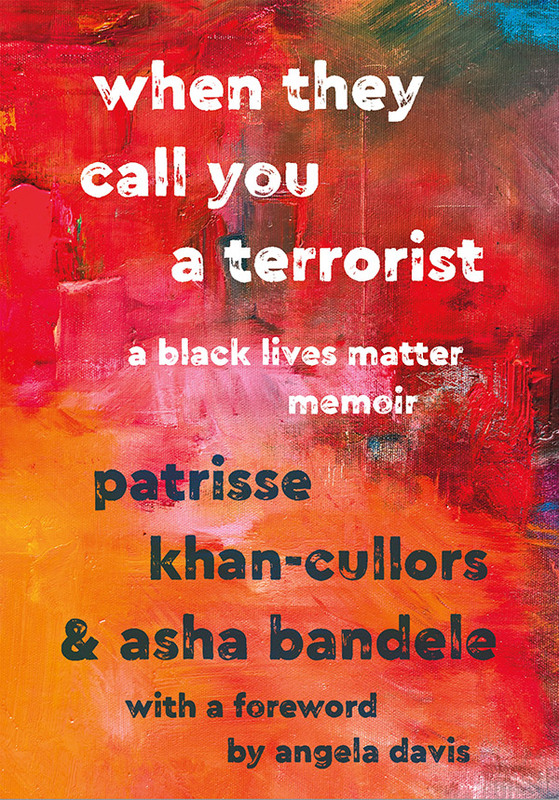 From When They Call You a Terrorist by Patrisse Khan-Cullors and asha bandele. 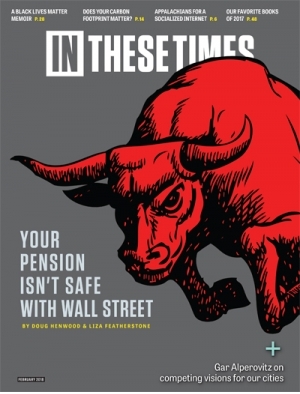 Copyright © 2018 by the authors and reprinted by permission of St. Martin’s Press.